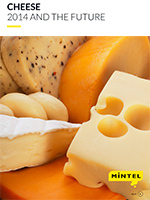 This global annual market overview will provide you with an in-depth review of the key issues in the global cheese market through 2014 as well as our forecast for what will happen in 2015 and beyond. The cheese retail market across major global markets is estimated to be worth about US$101 billion in 2014 with the US remaining the largest cheese market. Sales increased as a result of interest in healthy eating, snacking and gourmet cheeses. Cheese’s versatility and greater product varieties, flavours, and formats helped maintain interest in natural cheese. In the other major cheese markets – France, Italy and Germany – value growth is very slow. Cheese is not a universal food yet. In Asian countries such as China, Indonesia, Vietnam, Thailand, Malaysia or South Korea, consumption per capita is much less compared to most European countries. However, growing incomes, urbanisation, introduction of pizza and burger chains and changing eating habits in Asia are all contributing factors to the uptake of cheese in those countries, which are expected to be amongst the fastest growing cheese markets in the next five years.